Salmon Galleries is proud to present frequently changing exhibitions of contemporary and investment artworks. Our range includes original paintings, works on paper, individually designed and hand-crafted contemporary jewellery, ceramics and authentic Aboriginal work. 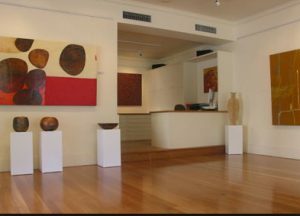 We show both well known and emerging Australian artists. We are conveniently located in McMahons Point, near North Sydney. Our modern airconditioned premises offers two levels for your appreciation and enjoyment. We offer a wide range of services to those interested in art; these include information on the personal enjoyment and appreciation of art, investing in art, framing, as well as interior design and placement services. One of our most recent services is a Bridal Registry, specifically directed towards the wonderful gift of art works. Please click ‘About Salmon Galleries’ for more information. Welcome to our website, and please drop in to see us.